New York City – A fresh round of authentic, bold and innovative Filipino flavors is set to descend in New York City and New Jersey beginning today. Filipino Restaurant Week 2016 was kicked off at a press event May 11th at the Philippine Center in New York where the 15 participating restaurants invited foodies to sample and embrace Filipino cuisine through their various menu offerings that feature flavors that are at once exotic and familiar, two seemingly contrasting descriptions that aptly characterize Filipino food. Filipino Restaurant Week, or FRW was first launched in 2015 as a response to the growing popularity of Philippine cuisine in the US mainstream and to put the spotlight on Filipino restaurants in New York and New Jersey. Consul General Mario de Leon Jr. presented to the press the participating restaurants, whose culinary offerings cover a wide spectrum of Filipino food – from the traditional, home-style flavors to the cutting edge fusion that incorporates bold innovations. “Whatever the form, foodies are assured of a unique gastronomic experience that will give them a grasp of the equally eclectic Filipino identity and culture,” the Consul General said. Kat Popiel, entrepreneurial content marketer and producer, expert in integrated digital campaigns, international food and travel blogger and a foodie “of the highest order”, congratulated the organizers of FRW 2016, and cited it as a way to boost the growing popularity of Filipino food. “It’s an exciting time for Filipino food. We’re seeing our dishes take hero status because of the likes of Jeepney’s Kamayan feasts in New York and Alvin Cailan’s Unit 120 incubator in California, then watching those ingredients and flavors permeate other menus,” Popiel said. Addressing the challenges faced by Filipino restauranteurs in mainstreaming Filipino food, Popiel cited the importance of staying true to the authentic flavor of the food, supporting each other and being bold in putting Filipino cuisine in the food map. Among the personalities present were Filipino chefs and restaurant owners who blazed the trail in elevating Filipino food into New York City’s mainstream consciousness through their creative work and bold business ventures, either through pop-up eateries, food trucks or full blown restaurants. These include Nicole Ponseca (Jeepney and Maharlika), Romy Dorotan (Purple Yam), King Phojanakong (Kuma Inn) and Aris Tuazon (Ugly Kitchen), whose work have been featured in mainstream print and broadcast media in the US. Guests at the launch event sampled signature preparations from the participating restaurants, which ranged from the traditional (crispy pata, lumpia shanghai and bibingka) to the slightly retooled versions of well-loved dishes (palabok with aligue, vegetable mélange on cassava ube tamales and cassava chips with batik). FRW 2016 features 15 Filipino restaurants that offer fixed price three-course lunches and dinners ($25 and $35, respectively, not including taxes and gratuity) that showcase the best of Filipino cuisine. It runs from 16 May through 27 May 2016. 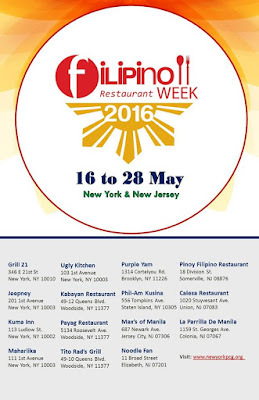 Complete information about Filipino Restaurant Week 2016 and of the participating restaurants, including their menu offerings, and how to make reservations can be found at www.newyorkpcg.org/frw.